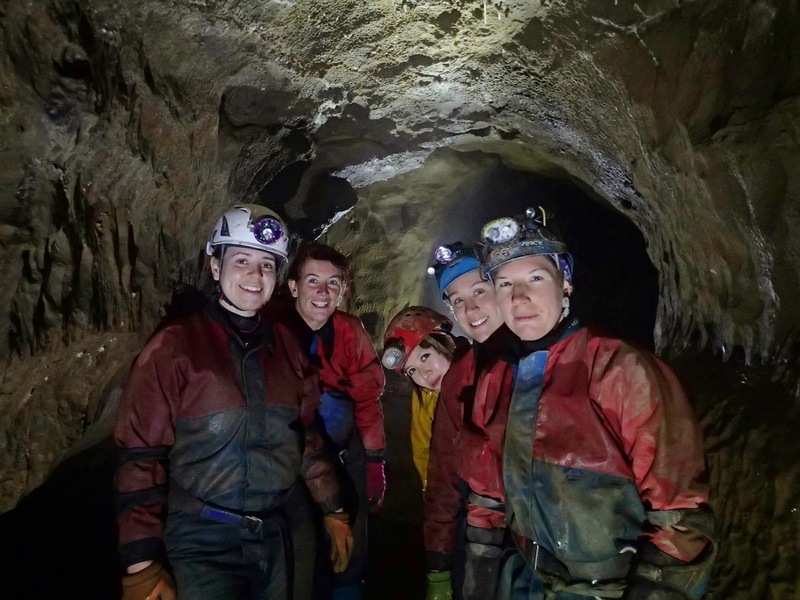 Dudley Caving Club: Going in Circles - Five Girls & a Fat Bloke! 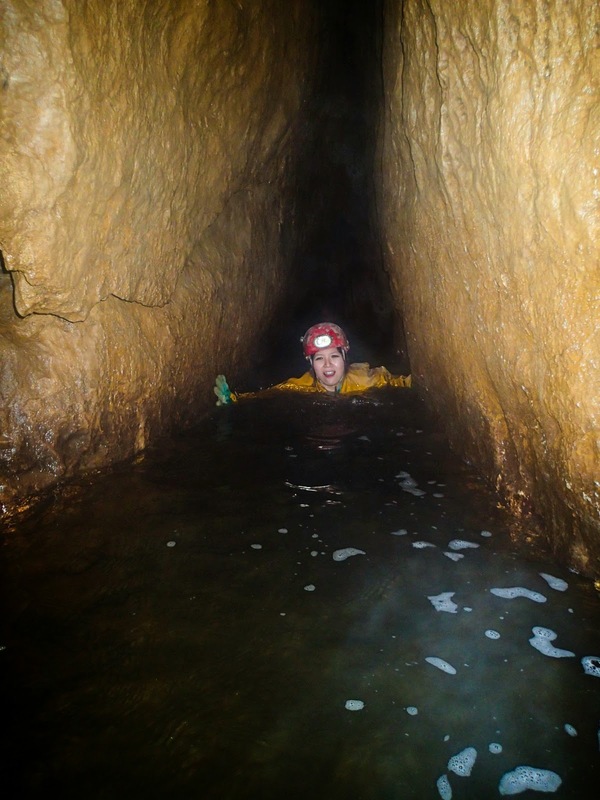 After 12 hrs of caving on the Saturday, on Sunday Jess and I staggered in for breakfast to find half the group had decided one day's adventures had been enough for them. This left us with only 6 people looking to go underground. Loz had talked Mel in to doing the outer circle route in Aggy, so it was decided that although it's not a usual Sunday trip, we'd give it a go. We arranged a 10pm call out with Keith figuring that as we weren't taking camera kit this should give us plenty of time & after the usual faff the group made their way down the escarpment. We logged in at the entrance at 12.30pm and Mel led us through the entrance series to Baron's Chamber in good time. At this point Loz took over the navigation, and as I'd done the Grand Circle route a couple of weeks ago with Brendan, I was able to help through to Northwest Junction. We headed up the Turkey Stream Way and Loz pointed out the other end of Coal Cellar Passage where hopefully we would all be emerging later at the end of the circle. Fun and squeaks were had at Turkey pool and then we headed on to Turkey Chamber. At this point navigationally everything went a little awry. Loz could remember bits of her previous trip but not in which order they came. At first we thought we were looking for a smaller passage off from the boulder slope and begun down St Valentine's Passage before it became obvious that this was definitely not a trade route and headed over the boulder slope to the correct route toward the Sand Caverns. We were soon crawling and stooping our way down Selenite Needle Passage. Loz thought she remembered a sandy crawl and we made our way through and down a rift in to a series of passages, again it became obvious after a while that this was not the way on and we reversed our way out of what we would later find out was Spiral Passage. Back en route and this time Loz recognised the junction at Eastern Avenue and we stomped our way around the inner circle through to the very impressive Dome Of St Paul's where we spent a little time gazing up at the spectacular ceiling before continuing on. Making our way in to Midsummer Passage we again had navigational difficulties and spent the next hour squirrelling around looking for the way on. Jess pointed out that time was against us and it was decided that if we didn't find the drop in to Coal Cellar Passage in the next 20 minuets that we would have to admit defeat. I found a polished flat out crawl that had been dismissed earlier and pushed through to obviously well travelled passage. We located the squeeze and Loz led the way. She spent a good 5 minutes trying to remember how she actually got through the last time and I began feeling a little uneasy as I saw her struggle through the awkward rift and drop the other side. I then had a go next and found that as well as snug it was extremely awkward and after a couple of attempts backed out to catch my breath and let Chloe have a go. Chloe also found the obstacle quite awkward, but was soon through. I elected to have another go and managed this time to get within a couple of inches from dropping through, with my legs rested on Chloe's head, but I just couldn't find a way to go any further. I couldn't push any further with my arms and couldn't get any purchase with my boots, so again backed out to let Mel and Crystal through. With my oversuit stripped off I had one last go, but again found that it wasn't how tight the obstacle was as much as I just got to a point where I couldn't keep any momentum. Now very aware of the time I sent the group off. We agreed that they would leave a note in the log book to let us know they'd got out ok. Tired and miffed at not getting through I kitted back up. Jess looked as tired as I felt, but I asked her if she felt up to pushing the pace a little so the others didn't have to wait too long at the hut for us and she agreed. We completed the Inner Circle route and continued on, missing the drop back in to the Turkey Stream Way and went on into Frozen River Passage. Fortunately we realised we hadn't been past these pretty formations on the way in and soon found ourselves back on the correct route. We put our heads down and kept pushing on and soon thought we could hear voices. We caught the group at the first climb up to the 2nd boulder choke. Loz looked the freshest out of us and it was agreed that she would run ahead and try to get out to halt the call out. I went with her to assist on the rope climbs till she felt happy and then returned to assist the rest of the group. Crystal looked pretty done in by this point and dug very deep to keep herself smiling and plodding on. We eventually reached the log book at 11pm. Loz had put a smiley by our names to show me she had got out safely. By the time we reached the Hut we found that Loz had a bit of trouble finding the key to get to her phone and Keith had done the prudent thing and initiated the call out. Fortunately a couple of the team live not far from White walls and had come to check things out and found Loz there. We were very glad to have not needed them and all learnt a lesson when it comes to not exceeding the agreed call out.